Thank you to Winchester College for allowing us to publish the image of Philip. 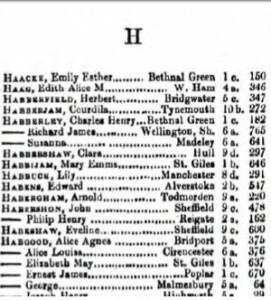 Philip Habershon was born in the 2nd quarter of 1893 in Redhill, Surrey and was baptised on the 23rd of April 1893 in Redhill, Surrey. 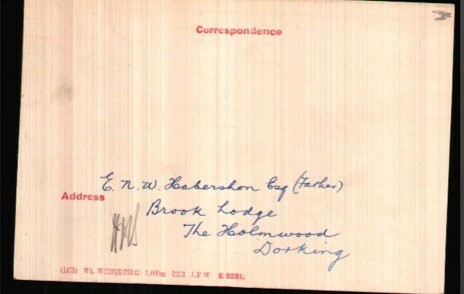 He was the son of Edward Neston Williams and Amy Habershon of Brook Lodge, Holmwood. He went to Winchester School after Mr Tabor’s preparatory school at Cheam. He was at Winchester from 1907 until 1911, when he followed his older brother Sidney to Clare College Cambridge. He would have just graduated in the summer of 1914. Philip’s great-grandfather Matthew was born in 1789 and was an architect. He designed several churches and other metropolitan buildings in Derbyshire, Yorkshire and the Midlands. He was particularly was involved in the London Society for Promoting of Christianity amongst the Jews and travelled to Jerusalem to arrange for the erection of the Anglican Cathedral of Jerusalem. He also wrote numerous books and pamphlet on religious matters concerning both Judaism and Christianity. 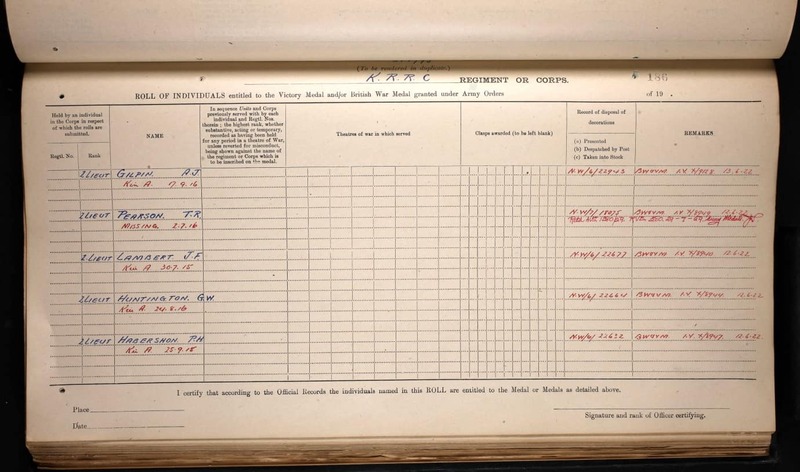 Philips grandfather also became an architect but in the 1891 census both he and Edward, (Philip’s father) were living on private means. Certainly in Philip’s generation his oldest brother Edward became a Church of England clergyman. In 1901 another family were living at Brook Lodge, the Habershons were living in Notting Hill Gate. The family became well known in Holmwood running knitting circles and soup kitchens. 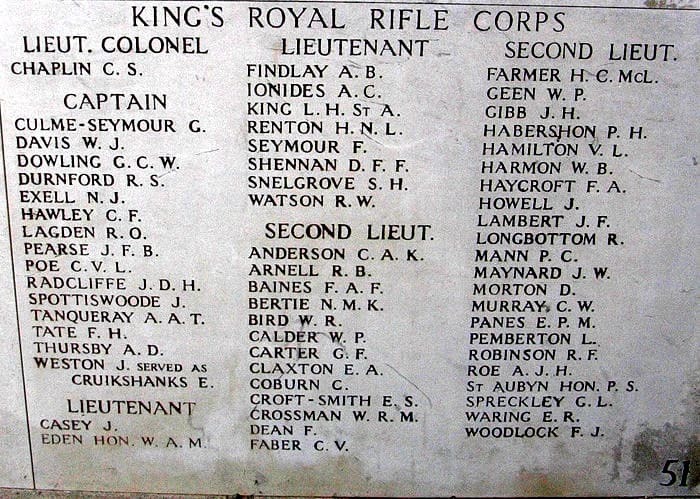 Initially, Philip joined the Duke of Cambridge’s Battalion of the Middlesex Regiment and served with them until November 1914, when he obtained a commission in the Kings Royal Rife Corps. He was with the 9th Battalion and was involved in the action at Hooge in the Ypres Salient on 15th July 1915. This was the first time that flame throwers were used. 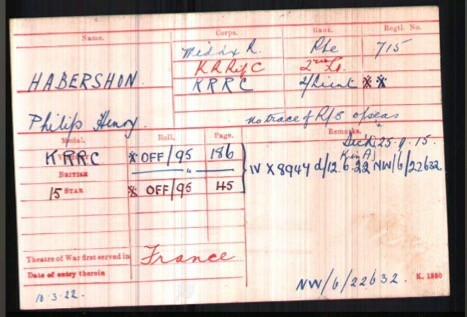 At the time of his death, Lieutenant Habershon was temporarily attached to the Rifle Brigade. He was killed in action during the attack on the German trenches at Bellewaerde Farm near Ypres, Belgium, on the 25th of September 1915. 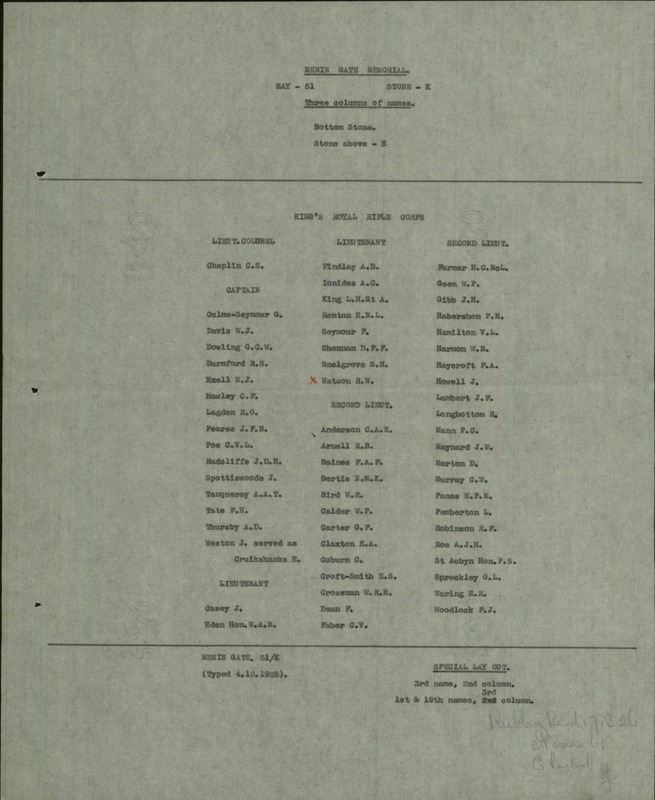 The 9th Battalion only returned from the Rest Area in Poperinghe the day before the attack. Philip’s body was never found. Philip Habershon received the British War and Victory medals and the 1915 Star. The 1915 Dorking and Leatherhead Advertiser reads, that his parents received a “gracious telegram of sympathy from their Majesties the King and Queen” and a message of sympathy from Lord Kitchener and his Commanding Officer. 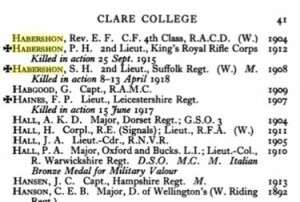 Philip Habershon of Brook Lodge, Holmwood, Dorking, Surrey, the 2nd Lieutenant Kings’ Royal Rifle Corps left to his father Edward Neston Williams Habershon Esq., £174, 8s and 7d in probate. His father also received Philip’s Soldier’s Effects. 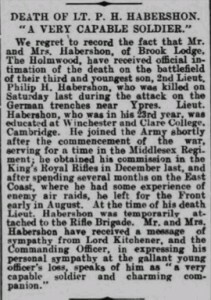 Philip Habershon is commemorated at the Ypres (Menin Gate) Memorial in Belgium on the panels 51 and 53. 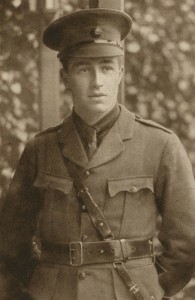 His older brother Sidney was also killed on 10 April 1918, leaving the oldest brother Reverend Edward Habershon as the only surviving son in the family.